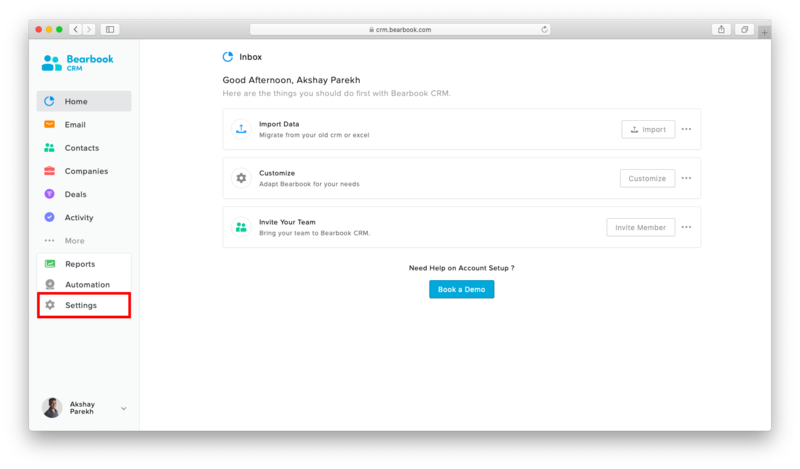 Bearboor user can use the CRM to call their customer directly from the CRM. To use the Bearbook phone feature, a user has to add his/her phone number to the CRM. 1.From the home, click on 'Settings'. 2.In the side menu panel, click on 'Phone Settings'. New Number - Using this premium feature, a user can choose the number as per their choice and user can use that number for their business phone calls. External Number - Using this feature, a user can use their existing phone number to map it with CRM and use that number for their business phone calls. Porting & BYOC - Bearbook will release this feature soon. Select your country and add your number and clickon 'Verify Number'. You will see the instruction about verify the number, follow that instruction to verify your number.